Permaculture is a design system, which implies that some sort of design process should be involved. If I was a TV presenter I would probably describe our approach to permaculture as “organic” but I’m not and so I’ll be honest and tell you that it’s haphazard, to say the least. We arrived in our new house with furniture to make and buy to make the house habitable and all manner of permaculture ambitions like raising chickens and planting a vegetable garden. Spring was well under way, and we both suffer badly from impatience, so we bought chicks and planted vegetables with permaculture ideas in mind but no formal process under way. Patrick Whitefield says that a permaculture design is usually presented “in the form of a map or plan of the design proposals” (The Earth Care Manual: A Permaculture Handbook for Britain & Other Temperate Climates see pp375-400). The design process starts in a “listening mode” with three aspects: a base map, a site survey and questionnaire. Patrick says that these three stages “can be taken in any order, but it’s often a good idea to start with a base map, because mapping a piece of land is one of the best ways to get to know it. Making a map takes you to every part of the site and requires you to look at it carefully.” A base map is therefore a representation of the current situation and the final stage in the process is the production of the design proposal map. We’ve got three maps to make, one of our whole site, one of our woods and one of the garden of our holiday cottage as we want to present an example of small space permaculture to inspire people staying with us. My own barrier to getting started often involves the fear of the unknown or the thought that the task will prove very/too difficult. This has been true of both the barn re-roofing and the mapping. However, once I’ve plucked up the courage to get started, I usually find that the task is less daunting than first appeared and that it starts to gain momentum. A good tip with a base map, particularly of a large area, is to try and find an existing map. This can then be traced and enlarged, with information added and deleted to suit. 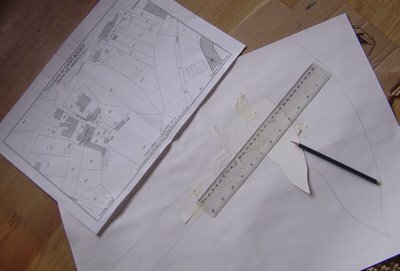 One method of enlarging is to tape the map over a large piece of paper, decide on a centre and measure every point out from this with a straight ruler joining the centre to the point, multiplying the measurement buy the same factor (e.g. x 2) and marking the new point on the same directional line. See the photo above and Patrick’s book for a fuller explanation. Creating a base map is hard work but well worth it. I did a permaculture design course this summer, led by Patrick, he is such a great guy. Thanks for dropping by and leaving a comment, Antony. I'm a bit behind with the blog and must write one soon on the continuing design process as we've done site survey, client questionnaire, evaluation and design proposals on the little gite garden. Then I started lifting some laurel bushes, only to discover a concrete hardstanding, which might change everything! I was very close to buying a GPS but several things put me off: in a woodland, the closed canopy would certainly degrade accurate positioning; the affordable "hobby" versions aren't apparently accurate enough for mapping; and that was all I neeeded it for and buying another electrical gadget, whilst appealing, seemed a bit unnecessary. And happily, the more we wlaked the wood and the more familiar we became with it, the easeir it became to relate the actual woodland to the various plans we'd obtained and then scale them up to produce our own map. So, thanks for the suggestion anyway but, unless one needs it for other things (liek trekking) I wouldn't buy one just to map with.